To see the seating chart for this concert click here. Please indicate your seating preferences in the If you have any special requests area during checkout. Purchased tickets will be available for pickup from the box office on the day of the concert after 7 pm. Celebrated for her “deep rich sound, exceptional virtuosity, and enthusiasm”, violist Marina Thibeault travels the world as a sought-after recitalist, chamber musician, and soloist. Marina is an ardent ambassador for new music, and seeks to champion diversity and innovation in the classical world. 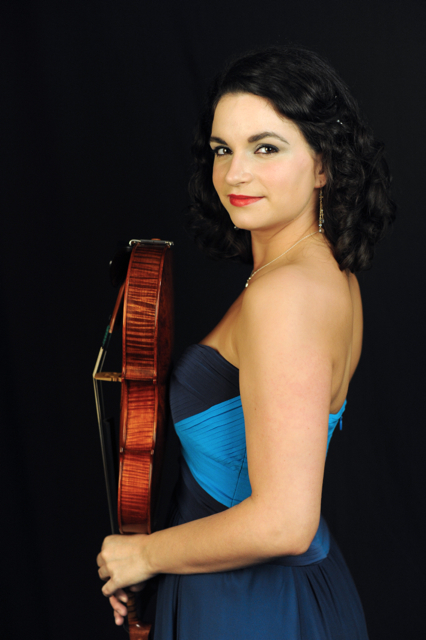 Commissioning new works for viola is a vital calling for Marina, and she works closely with various composers, amongst whom, Jean Lesage has said of her playing: “There is musicality in every moment.” Ms. Thibeault was named "Révélations Radio-Canada 2016-2017" and was a recipient of the Sylva Gelber Foundation award (2016). She won first prize in the string category of Prix d’Europe (2015), the McGill Concerto Competition (2015), the Radio-Canada “Young Artist” prize (2007) as well a special prize at the Beethoven Hradec International Viola Competition (2008). An avid chamber musician, Marina has collaborated with members of the Guarneri Quartet, the Cleveland Quartet, and the London Haydn Quartet, amongst other renowned chamber musicians. Her interest in new music has led her to work with composers such as John Corigliano, Joan Tower, and Krzysztof Penderecki. At 9 years old, she was the youngest violin student to enter the Conservatoire de Musique de Québec. She holds a bachelor’s degree from the Curtis Institute of Music, where she studied with professors Michael Tree and Roberto Diaz. In order to deepen her studies, she attended the Conservatorio della Svizzera italiana under the tutelage of Bruno Giuranna, with the help of the Canada Council of the Arts and the Eskas Scholarship. Marina holds a Master’s degree with André Roy at McGill University, where she will start her doctoral studies in the fall. Past festivals attended include the Music Academy of the West, the Perlman Chamber Music workshop, Taos School of Music, Aurora Master classes, McGill International String Quartet Academy and IMS Prussia Cove. Marina's first album, Toquade, was released in April 2017 on the ATMA label. Upcoming performances include her debuts with the Orchestre Métropolitain, the Appassionata Chamber Orchestra, and the Orchestre Symphonique de Drummondville. Marina plays on an 1854 Jean-Baptiste Vuillaume viola, and a W.E Hill Sons bow, generously loaned by Canimex. An acclaimed soloist with Sinfonia Toronto in several previous seasons, flutist Mario Carbotta has performed with too many orchestras to count. A very short list should include the Mannheim Chamber Orchestra, Mainz Chamber Orchestra, Prague Virtuosi, Strings of La Scala, Vienna Tonkünstler-Orchester, Südwestdeutsche Philharmonie Israeli Symphonette, Orquestra do Algarve, Orquestra Classica de Madeira, Orchestra of the Provincia di Bari and San Remo Philharmonic, but there are dozens more. Mr. Carbotta is one of the world’s most-recorded flutists, with releases on Dynamic, Tactus, Nuova Era and Rugginenti. He has issued recordings of works by Sammartini and Pilati, the complete flute works of Mercadante, the complete flute works of Nino Rota, many CD’s of deserving works by little-known classical composers, and many CD’s of 20th- and 21st-century works, including music composed for and dedicated to him. In demand as a teacher, he has given courses and master classes in the US, the International Academy of music in Milan and the International Summer Courses in Nowy Sacz, Poland, and has recently been appointed to a permanent Professorship at the Boccherini Conservatory in Lucca. “Most people today no longer possess beliefs, love and ideals. The spiritual dimension has been lost. My intention is to provide food for the soul and this is what I preach in my works.” Thus Peteris Vasks, the son of a Baptist pastor well-known in his native Latvia. Vasks’ beliefs were unwelcome and his expression restricted during Latvia’s Soviet period, and his works were not readily disseminated, but in recent years they have become widely admired and performed. Vasks combines ancient and folkloric elements of Latvian music with a highly personal approach to contemporary styles. He often gives his works programmatic titles based on the natural world; he does not depict nature in his compositions, however, his purpose is to interpret humanity’s relationship with nature, and to awaken us to its beauty and the grave danger that looms from ecological and moral decline. He also draws on his own life and Latvia’s historical suffering. At only 10 years old, he composed a freedom-fighting song for chorus in reaction to hearing of people sent to detention camps. In recent years Vasks has focused on concertos for string instruments string chamber music, and works for string orchestra, including the violin concerto Distant Light, performed with Sinfonia Toronto by Andrea Tyniec in April 2017, and his second violin concerto, Lonely Angel. Like both of these works, the Viola Concerto has received many performances around the world, but this evening’s performance is the first time it is played in Canada. A rich, sonorous texture in the orchestral parts supports the solo viola and casts an especially warm glow in the slow movements. The two middle movements demand great technical ability from the soloist, particularly in their extended cadenzas. On hearing the world premiere, a reviewer compared the first movement to an English favourite, citing “heart-rending beauty that one might have thought had become extinct with the music of Finzi and his contemporaries.” The scherzando second movement’s folk-like solo over orchestral drones offers a delightful contrast between the opening movement and the “Elgarian nobility” of the Andante third movement. A lyrical finale takes time to knit its strands together, at length emerging as a benevolent and beautiful farewell. Dance suites were the most widely-cultivated genre of instrumental music in the Baroque period, using dance forms as the basis for sophisticated invention. Some of the forms derived from court dances and others from 17th-century ballet, and all possessed specific structures and rhythms. Bach adopted the dance suite format for many works, including his partitas, French suites and English suites for keyboard; solo partitas and suites for violin, lute and cello; and four suites for orchestra. The Suite in B minor is the most intimate of the four orchestral suites, scored for flute, strings and continuo. Dating of all four is uncertain, but this suite may have been written around 1738-1739 while Bach was working in Leipzig, where among many other responsibilities he directed the Collegium Musicum in weekly public concerts which included many of his own works. As customary for dance suites, the first movement moves from a slow opening in dotted rhythms to a faster section of quasi-fugal imitation. In most suites both of these sections would be repeated, but occasionally, as here, the slower opening music returns to end the introductory movement, with a recurrence of the faster section. The rest of the suite presents beautifully stylized versions of dances that retain their rhythmic and structural patterns but are clearly intended for concerts rather than actual dancing. The flute part requires charm and also virtuosity in sections like the Double of the Polonaise, and Bach’s good humour breaks out in the last movement Badinerie, a musical term he to describe the flute’s cheerful “banter” with its friends in the orchestra. Brahms originally wrote his Variations and Fugue on a Theme of Haydn for piano in 1861, as a birthday present for his great friend and mentor Clara Schumann, Robert Schumann’s widow, who although not sufficiently recognized in her own right as a composer remained an important influence on Europe’s next generation. At the time Brahms encountered the theme in a piece for wind ensemble, it was credited to Haydn, but later scholarship has thrown doubt on this attribution, linking the melody to a folk tune adapted as a hymn. Brahms’ work is therefore now known also as the Saint Anthony Variations. Consisting of an opening presentation of the theme plus its variations and a closing fugue which provides a climax of dynamics and contrapuntal grandeur, Brahms’ masterpiece strikes the ear as a series of waves, rising and falling curves of tempo and texture that build towards the fugue. There are also many fascinating secondary patters within the larger waves: major and minor keys alternate; variations with smoother and more staccato textures generally alternate; and variations with fragmented structures are usually followed by more unified ones. The significance of each variations is thus heightened by its relationships with its predecessor and its follower as well as its role in a rising or falling wave.